Helping GA Alumni in their next step, the job search. General Assembly offers 12-week immersive courses in a range of technology fields: Web Development, Data Science, UX Design, etc. The courses are intended to teach students the skills they need to enter their chosen field as a junior-level candidate upon graduating. Entering the job search is a big hurdle, as most GA alumni have no previous experience in their field. The only relevant experience on their CV is their work at GA.
How might we help GA alumni in their unique job search? We spoke to both sides of this exchange: students & teachers, as well as recruiters. What we found most interesting is that the students & the teachers had stories to tell, and the people that were hiring were most interested in what you can't capture on a CV, their story. 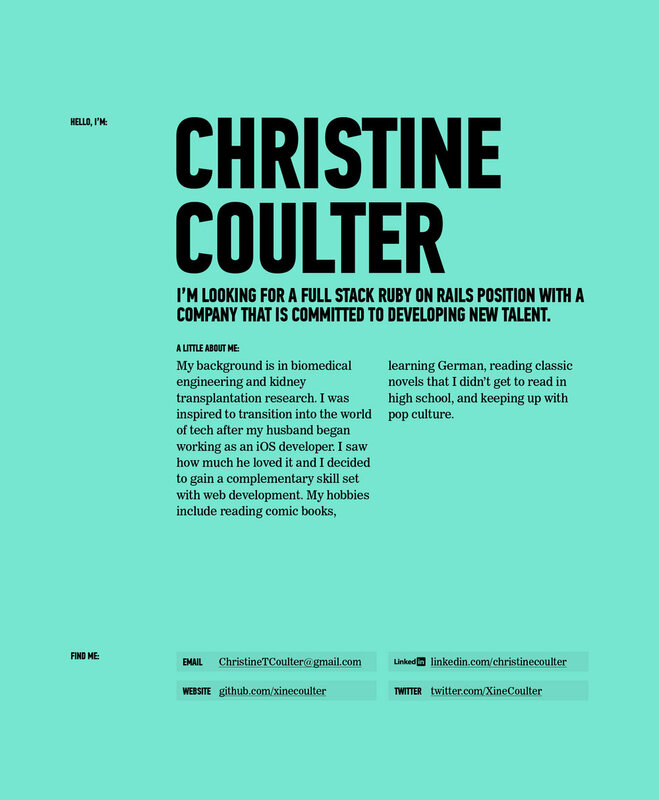 The typical job CV/Portfolio does not provide this, so we built and launched GA Profiles to provide a way for alumni to tell their story, and to provide a destination for recruiters to find new tech talent. In order to get into the mind set of our alumni, I first needed to understand their student experience and curriculum. The great thing about GA was that we worked in the same building as the classrooms, so we got to head down a flight of stairs and do user research with teachers and students on the fly. One user journey touchpoint that we saw a lot of opportunity in was the "Meet & Greet." One week before graduation, GA threw our version of a "hiring fair" in which we welcomed anybody seeking tech talent in NY and presented our soon-to-be on the market students. Students prepared resumes and demos of what they learned throughout the course, and teachers put together a printed booklet of all of their students for the attendees to take home. The books didn't provide enough information. Conversations that were happening were about culture, interests, learnings, and digging into the students' stories. "Why did they choose this route?" We honed in on this problem with the goals of making it easier for the students to tell their story in a way the recruiters were interested in, as well as to get them as much visibility as possible in the hiring market. I put together this map of GA products in relation to the student journey. This helped me understand the wide rage of company offerings, as well as guide where alumni products would sit in relation to them. Based on our Meet & Greet research, I started on explorations of how to tell a career story. For the initial concept, I started by using my own story as inspiration. How would I tell my career thus far? Usually resumes are reverse-chronological, and as we were sketching this, we had the idea of instead, starting from the beginning. I wanted to emphasize the layering of learning per stage, including the ability to add skills learned, "Discoveries," and formatting options like block quotes for emphasis, and "life chapter breaks" to further emphasize the twists and turns of a life story commonly found in Immersive students. This was a WYSIWYG concept for filling out your story in-line. Yellow sticky notes were intended to provide helpful hints on how to frame your answers, all based on feedback we heard from recruiters. 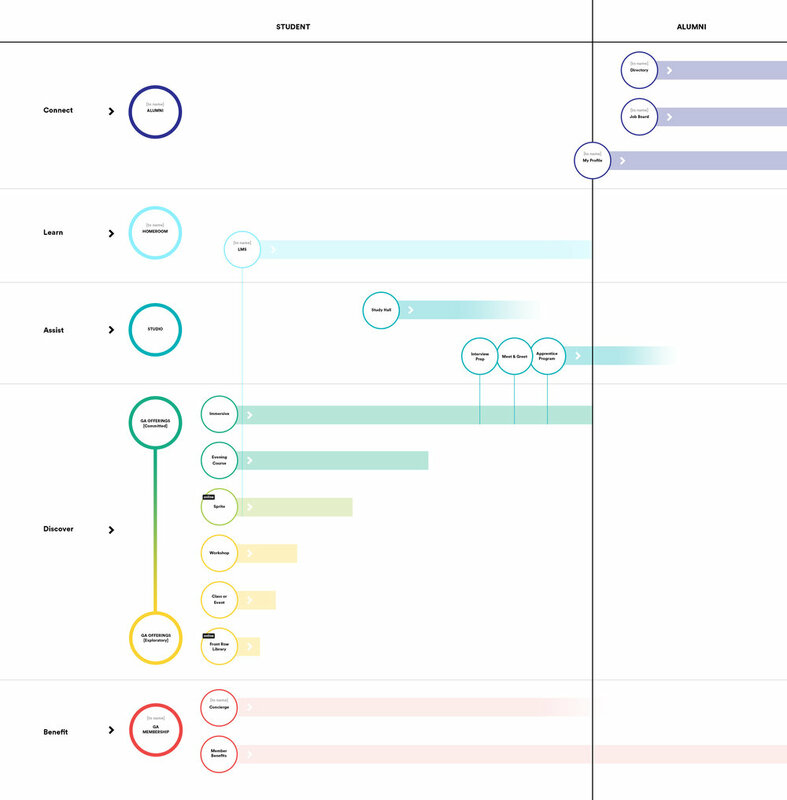 For the MVP release of this product, we had to scale the concept designs way back. The intricate interface and in-line editing would have taken quite a lot of time to develop, and I under-estimated the amount of time it would take for students to fill this out. Recruiters also wanted a summary section that was easier to scan. We brought an abridged design to life that emphasized the alumni's skills, and offered small ways of differentiating through a large quote and a Q&A section. Profiles was incorporated into all Immersive Course curriculum and to this day remains a great resource for recruiters to find great new talent.